If you’ll be in Brooklyn this Saturday I look forward to seeing you at the Gygax Magazine unboxing! If so be sure to RSVP via their website, if not there will be streaming video of the event and some other online goings-on that’ll make checking the site that day worth your while. Plus 1st edition AD&D with Dwarven Forge! I’ve had the pleasure of helping the rebirth of TSR from the start – I think only founder Jayson Elliott and Games Content Editor James Carpio are senior to me. For a while my title was Guy Who Introduces Jayson To Former TSR Employees which was a lot of fun, but around the time that the magazine emerged as the most promising thing TSR could do as its launch Jayson got sucked up actually making that happen and I became busy with other stuff too. Once the magazine was thrust into the spotlight the title I chose for myself was Events Coordinator, although something with outreach in the name would probably be better. The reason I’m excited to be part of an ambitious, old-fashioned print magazine is the opportunities it affords to draw gamers together the way the letters column in wargaming zines did for guys on the magazine’s masthead like Tim Kask and Ernie Gygax, and to be the mystique-laden physical artifact that draws outsiders in the way zines like Factsheet Five did for the generation Jayson and I come from. 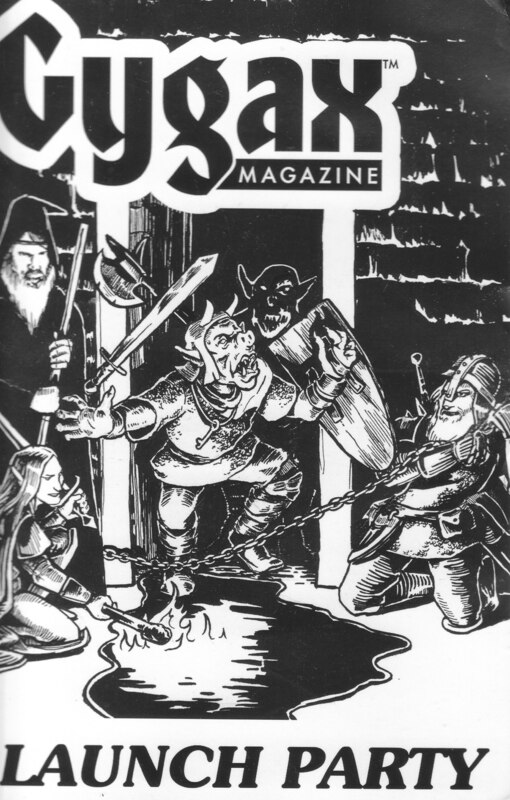 If there is something happening that you think the kind of people who’d dig Gygax Magazine would enjoy, let me know and I’ll add it to the calendar. Eventually we’ll have a more formal way to do so but for now you can comment here or email/G+ me at barnar.hammerhand@gmail.com. If you are in the tri-state area – which is the low-hanging fruit we can use to demonstrate “here are the kinds of things Gygax Magazine thinks its audience might enjoy” – is Bushwick outside your comfortable travel range? This shot from the DIY Dungeons @ Silent Barn is fan service for the kids in my afterschool class who’ll excited to see the Minecraft creeper. Also pictured: Inna from Butter the Children, who headlined the show later that night. This Monday DIY Dungeons put on a successful event at Silent Barn, a DIY space that’s just opened in a bigger location, 603 Bushwick Avenue, at the beginning of the year. 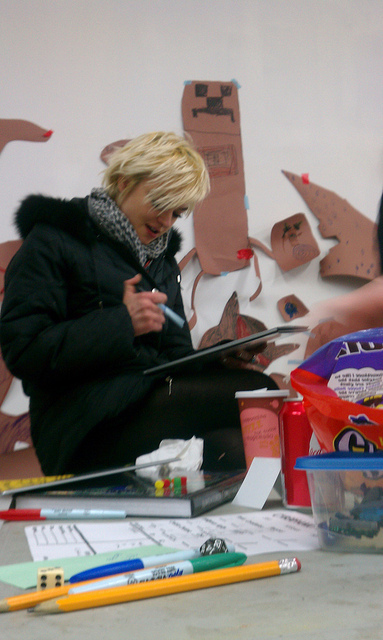 They’re also doing a Babycastles game jam so are clearly our kind of peeps. The thing Jayson and I were thinking is missing from our local gaming scene is a purely social gathering. We’ve got convention gaming with nerdNYC’s quarterly Recess, Organized Play and the self-organized kind with the world’s biggest D&D Meetup group, plus groups predominantly focused on actual play like New York Red Box. The thing we don’t usually have (and NYRB always seems eager for more of) is a chance to hang out with one another and other gamers and our friends who maybe aren’t gamers yet but are open to having a good time. This kind of get-together is easy to organize when it’s nice outside, but in the winter a place like Silent Barn is ideal. However, nerdNYC’s Terry, for whom I have mad respect, thinks that Bushwick is one subway transfer too many for most of the folks who come to Recess. If you have an informed opinion on these matters I am eager to hear it. If not, I encourage you to think about where you might want to get together with folks in the place where you live, and then make it happen and tell me about it so I can put it on Gygax’s calendar. Enter your email address to subscribe to this blog & get email notification of updates. I wish to follow the Mule!